The sun was shining bright and there wasn’t a cloud in the sky. With a backdrop like that, it was hard not to fall instantly in love with the town of Banff – a seaside retreat in the corner of the north-east. It was great seeing the town at its best, with the gorgeous winter weather creating a lovely holiday feel about the place. It’s on days like these when properties can really stand out. And one that has definitely caught the eye of residents and visitors alike is The Granary, a development of nine flats of differing sizes. More than a decade ago, however, the historic building was catching people’s eyes for the wrong reasons. After such a rich past, it had lain pretty much derelict for around 10 years, casting a bit of a shadow on the area surrounding it. But under the ownership of AD Walker Ltd, with director John Walker at the helm, new life has been breathed into it. It was John that I was here to meet and hear about this fantastic building from. He told me that his company had bought the building 20 years ago with a vision in mind to develop it. 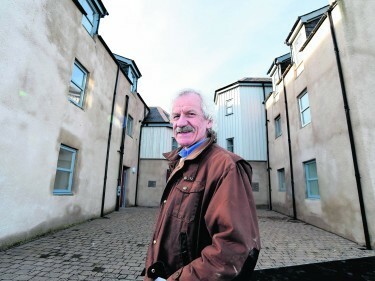 However, it turned out their initial plan was not viable and it was through the help of Banff Townscape Heritage Initiative – with manager Christine Pert at the helm – the Renaissance Project plus Aberdeenshire Council and Historic Scotland, that the company was able to bring a new plan to fruition. 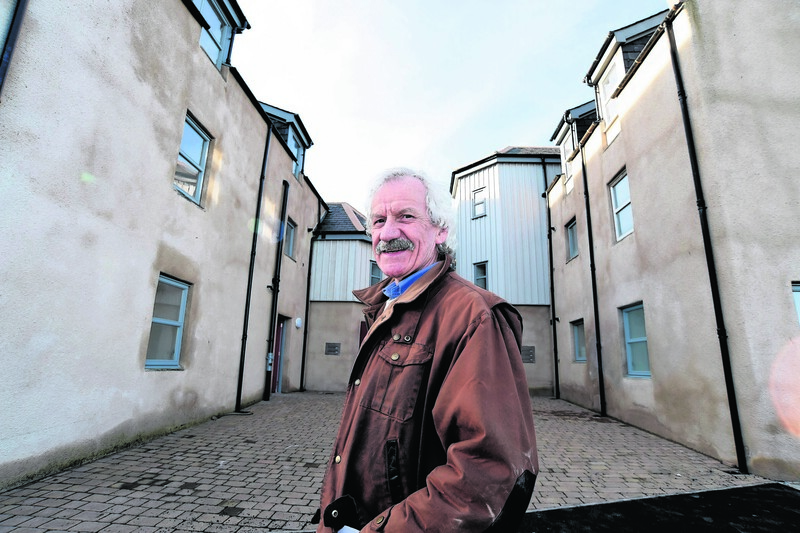 John, who recently retired but wanted to see the Granary project through to the end, said: “They helped us get a number of grants such as the lottery fund, to make the project financially viable. Over the past five years, work has been taking place to transform this historic building and Architects Future Plans came up with the vision. Lots of effort has been taken, with the help of Historic Scotland, to preserve many of the delightful features this building originally had. Given its B listed status, the team were restricted with what they could do with the building, but that has resulted in something quite unique. 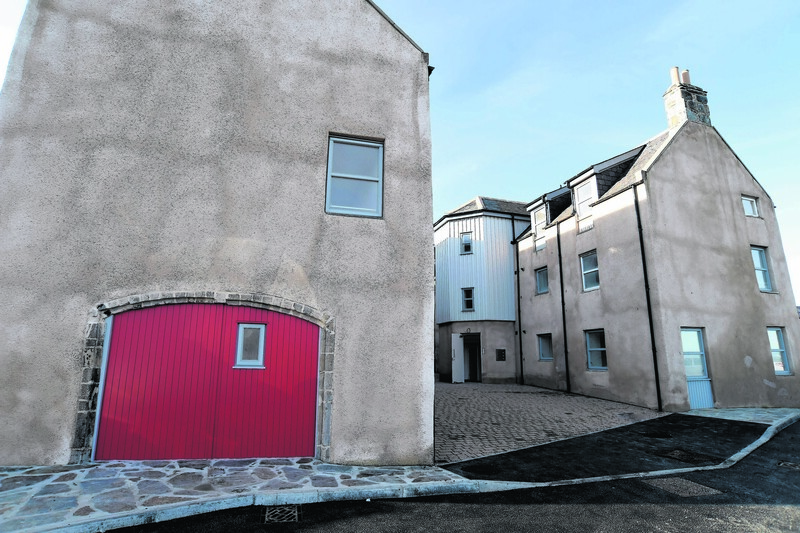 The former granary comprises three sections; a middle portion has been removed to create a central courtyard which is bordered by the residential units. The building is in Banff’s conservation area. 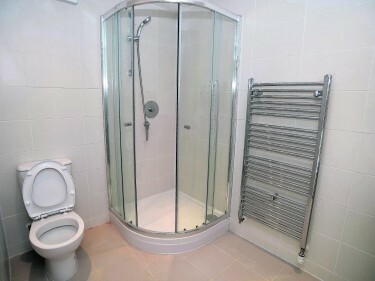 Inside, there is a mix of one, two and three-bedroom flats and two and three-bedroom maisonettes. 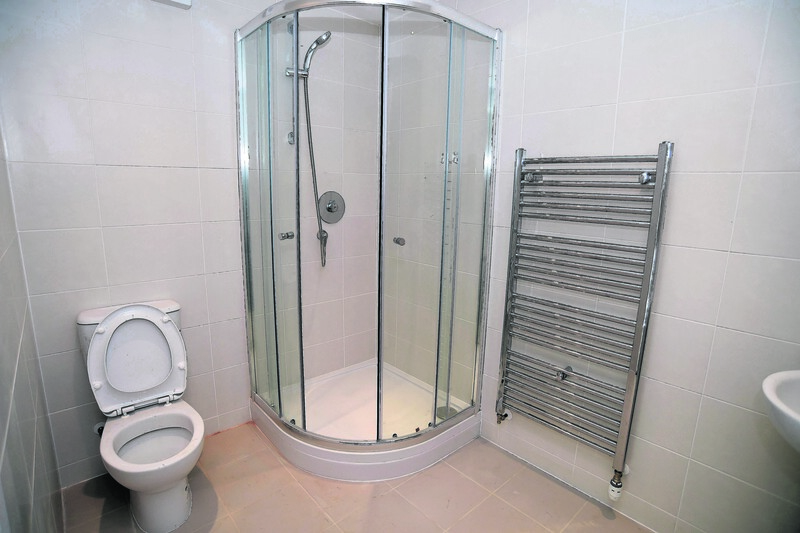 All properties have lovely unusual layouts with lots of spacious rooms. Some of the apartments boast great uninterrupted views of the Banff Bay and surrounding area. The apartments have been finished to a high quality and blend the traditional exterior of the building with the contemporary interiors perfectly. Each property also comes with a store on the ground floor of the west wing, great for those with storage facilities at the top of their checklist. 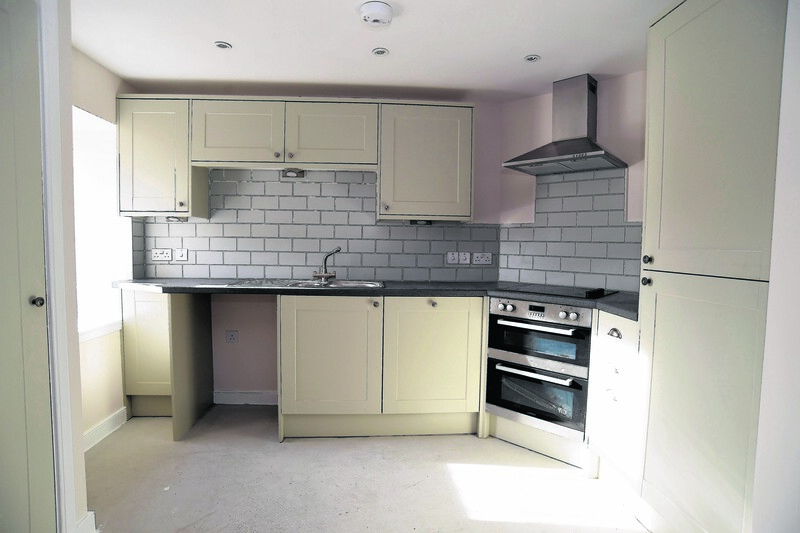 Prices range from £70,000 for the one-bedroom flats to £140,000 for the three-bedroom maisonettes. “The development offers something a little different,” John added. “It is a hugely historical building which is nice and central and the interiors are very modern. “Four of the first five people to look around have already reserved an apartment. 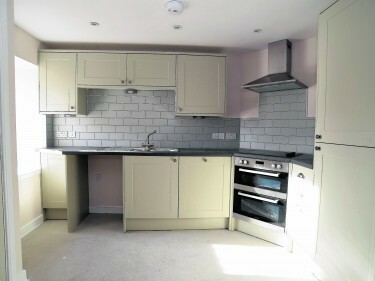 They really liked the layout, they are all very different and they were very pleased with the quality of the finish. “There are few opportunities to buy into Scottish history like those provided by The Granary at Banff. Set in the heart of historic Banff overlooking Banff Bay at the mouth of the River Deveron, this site finds itself connected to a mediaeval saint, Scottish Wars of Independence, smuggling and Lord Byron. During the mid 1700s, there was a financial boom based on smuggling, following the Union with England in 1707. Right at the start of this boom, in 1728, The Granary’s new owner and the town’s Provost, James Shand, became a very successful “merchant”. offload goods in and out, without suspicion. It was while James Shand was Provost of Banff in 1732 that David Copper, the Excise Officer, unexpectedly arrived in town. He was immediately seized and thrown into jail at the Tollbooth. Sometime later, presumably once the coast was clear, he was released with claims that there must have been some kind of mistake. James Shand was succeeded by his son, also James. He continued in the family business and operated very successfully from The Granary until his death in 1795. It was during this period, with the increase of trade, that the two main wings surrounding the courtyard were constructed. James, like his father, became Provost of Banff – three times. It was his son, William, who sold up the premises and moved to the family Craigellie country estate. All three of these ancestors of the Duchess of Rothesay are buried in St Mary’s Kirkyard next to The Granary. William Shand’s home, Shore House, was sold to Elizabeth Davidson. She was the great-aunt to renowned poet Lord George Byron. As a child, Byron stayed with relations at the Manse, which was demolished in the 1930s, but was situated behind The Granary at the bottom of Water Path. By Julian Watson, of the Banff Preservation and Heritage Society.